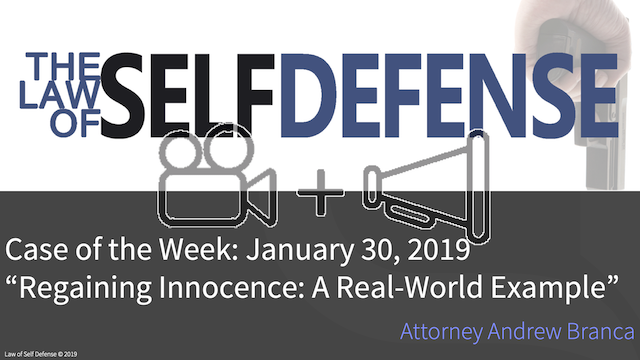 One of the five elements of a claim of self-defense justification for a use-of-force against another person is the element of innocence, which denies the justification of self-defense to a person who was the initial aggressor in a fight. “Initial aggressor” generally means the person who was the first to threaten or use unlawful physical force against another. It is possible for someone who was the initial aggressor, and who has therefore lost the element of innocence and lost the legal justification of self-defense, to in effect regain their innocence and therefore regain self-defense. There are two ways this can be accomplished. The first method is known as “withdrawal & communication,” and it involves the initial aggressor physically withdrawing, or making a good faith effort to withdraw, from the fight in combination with effectively communicating to the other party that they no longer want to fight. With the person who was the initial aggressor now withdrawing from the fight, for the fight to continue the other party has to come to them. In effect , the law holds that by withdrawing from the conflict the initial aggressor has ended the first fight, the fight they started, and the other party is now the initial aggressor in a second fight—and in that second fight the person who had been the previous initial aggressor has regained their innocence, and therefore regained self-defense. The second method to regain innocence is under circumstances of escalation. This occurs when a person is the initial aggressor in a non-deadly force fight. So long as the other party responds to this attack with mere non-deadly force they are arguably simply acting in lawful self-defense. Imagine that an initial aggressor throws a punch, and their intended target physically shoves away that attack. In that case we have a non-deadly attack, non-deadly defense, it’s consistent with another mandatory element of a self-defense claim, the element of proportionality. What happens, however, if the first person uses or threatens mere non-deadly force and their intended target escalates to a deadly force response? So, the first person throws a punch, and the second person responds bringing a knife or gun into the fight as their response. A deadly force response to a non-deadly force attack is an excessive use of force as matter of law. Doing so violates the self-defense element of proportionality, so that the deadly force response cannot be justified as self-defense, and thus the deadly force response is unlawful. Under these circumstances, the first person, the person who initiated the non-deadly force fight, is permitted to defend himself against the unlawful deadly force response, and justify his response as self-defense. In this Case of the Week we see an initial aggressor regain innocence arguably by both of these methods in a confrontation reported on by the web site Michigan Live. The confrontation occurred at a Detroit gas station, and these facts are as reported by the website Michigan Live. They report that an unnamed 25-year-old was the initial physical aggressor in a dispute with 34-year-old Ali Salman. The cause of the confrontation is not reported, but things went physical when the 25-year-old threw the first punch. The punch struck Salman in the upper body but did not knock Salman down. It is undisputed that the 25-year-old was the initial, non-deadly force aggressor. After that punch was thrown two things happened that are relevant to the doctrine of an initial aggressor regaining innocence: the 25-year-old non-deadly force initial aggressor (1) withdrew from the fight, and (2) Mr. Salman responded to the punch by pulling a gun. As a result, the 25-year-old arguably regained his innocence. One, the 25-year-old arguably regained innocence by withdrawal. Two, the 25-year-old arguably regained innocence because of Salman’s escalation of a non-deadly force fight to a deadly-force fight. In any case, Salman didn’t merely draw his gun, he chased the fleeing 25-year-old and pointed his gun at him. Salman has now become the initial deadly force aggressor in a second fight. In response to this act of aggression by Salman, the 25-year-old drew his own gun and shot Salman in the head. Salman would die of the gunshot wound. Michigan State Police initially sought a warrant for the arrest of the 25-year-old. After viewing surveillance video of the confrontation, however, local prosecutors have declined to charge the 25-year-old for the shooting death of Salman and ruled the shooting a lawful case of self-defense. And there you go: Regaining innocence in real-world action. But Mr. Macho had started backing and turning away when he saw the gun. Still he was shot. Regardless of whatever defense, the attorney who wins this one earned his pay. We addressed that event in an earlier blog post, not sure if it made the migration to this new platform. Wow that is an interesting story. Glad I read this. I don’t see my self in the 25 year old guys situation nor the 34 year old guys. I don’t start fights and do everything I can to avoid them too! I agree with your analysis under Michigan law. However, this discussion is an excellent point at which to discuss the differences in the law in other states. Texas Penal Code on the use of deadly force is different. In Texas, had Salman not chased his assailant, but merely produced his gun with the intent to show that he would use deadly force if necessary, the 25 year-old would most likely be charged with murder as Salman would not have used deadly force and thus would not have escalated. Indeed, know the law, especially where you are, so you are hard to convict. The catch is who determines if this condition of that statute has been met, and by what standard? ” …as long as the actor’s purpose is limited to creating an apprehension that he will use deadly force if necessary …” Is it sufficient merely that the suspect claim this was “limited” purpose? If so, why wouldn’t every defendant make that claim in order to benefit from the statutory protection? Alternatively, if some other party determines if that condition has been met, then the statute is only helpful if that other party decides to allow it to be helpful. If the unnamed 25 y old would have drawn his gun in the initial confrontation and the results still the same (Salman dead from GSW) .. would 25 y old then be at fault?? If the initial aggressor BEGINS with DEADLY force, there’s no place for escalation to go–deadly force is as high as it gets. So, no, an initial deadly force aggressor cannot benefit from the doctrine of regaining innocence under circumstances of escalation. Were they both authorized to carry firearms in Detroit? If not, isn’t there still an offense that warrants indictment for criminal intent pending opportunity? Perhaps, but that weapons offense would be unrelated to the use-of-force analysis. We focus here on use-of-force law, not gun law, two entirely separate things.